Linear algebra is absolutely everywhere, and many algorithms and data structures use this basic mathematical operation. There are several ways we can multiply arrays of data together in Python - some slow, and some extremely efficient/fast. First and foremost, we have NumPy's dot method, which multiplies two arrays together (I, however, tend to write something along the lines of from numpy import dot as mult, so the fact that it's a matrix multiplication is more obvious). EDIT: It should also be noted that in Python 3.5+, the __matmul__ method defines the @ infix operator, so instead of np.dot(arr1, arr2), we may write arr1 @ arr2 (c.f. PEP 465). It's pretty darn fast. For example, using the following little script, I arrive at the following graph of array scales vs. time using Numba's jit decorator, dot and einsum.
""" 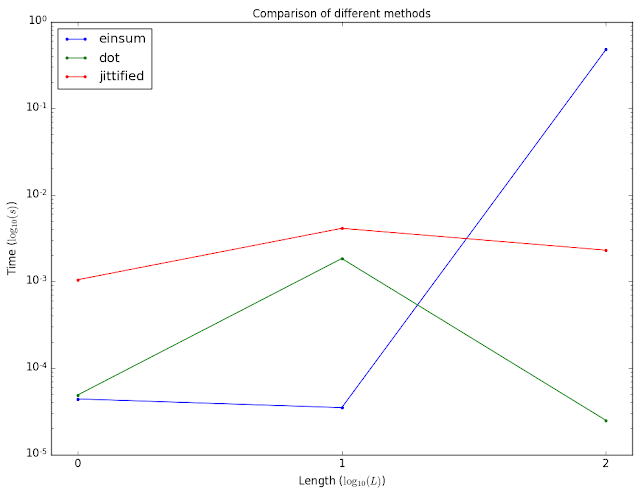 time a method """
Comparing different methods' times for matrix multiplication in Python. By the way, this is a great resource for learning a little about np.einsum. (If you'd like a humbling experience, check out the source code on GitHub as well.) The end result is, of course, that this method isn't great for working with large data. On the other hand, jit does a remarkable job!